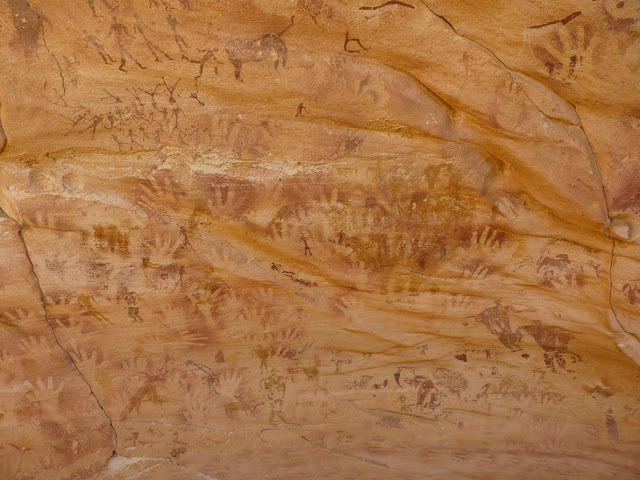 TYWKIWDBI ("Tai-Wiki-Widbee"): Those hand prints on cave walls? Lizard hands. Honoré initially suspected monkey paws, but when those proportions were also off, colleagues at the Museum of Natural History in Paris suggested she take a look at reptiles. So far, the examples that have proportions closest to the "baby" hands come from the forelegs of desert monitor lizards or, possibly, the feet of young crocodiles. (The crocodile study is still in progress.) Monitor lizards still live in the region today and are considered protective creatures by nomadic tribes in the area. The story continues at National Geographic, via Smithsonian. Those definitely aren't crocodile paws.The webbing isn't present (even though it would not be spread at that level of abduction, it would still make the digits appear shorter. The shape and proportions within and between the digits are all wrong. The arms visible at the base of some of the small prints are way skinnier than a Nile or Desert croc's front limb would be, and don't have the prominent ridgeline of scales down one side. I could maybe buy a monitor lizard's front paws, though. So, did the artist hold a lizard up to the wall and spray paint over their paws/claws/hands?